A Wedding is such a personal celebration – gathering family and friends to witness a new milestone in your life. Guest often travel long distances to be at the wedding, many spend money on new attire so they look perfect for your special day. They take time and money to purchase a wedding gift and they gladly give the their time to attend this celebration and witness your new life of marriage. To honor your guest’s support and celebration of your new life, a thank you note should be just as personal to show your appreciation for their love and generosity. RECENTLY my niece married Kevin in Camarillo, CA (near Santa Barbara). 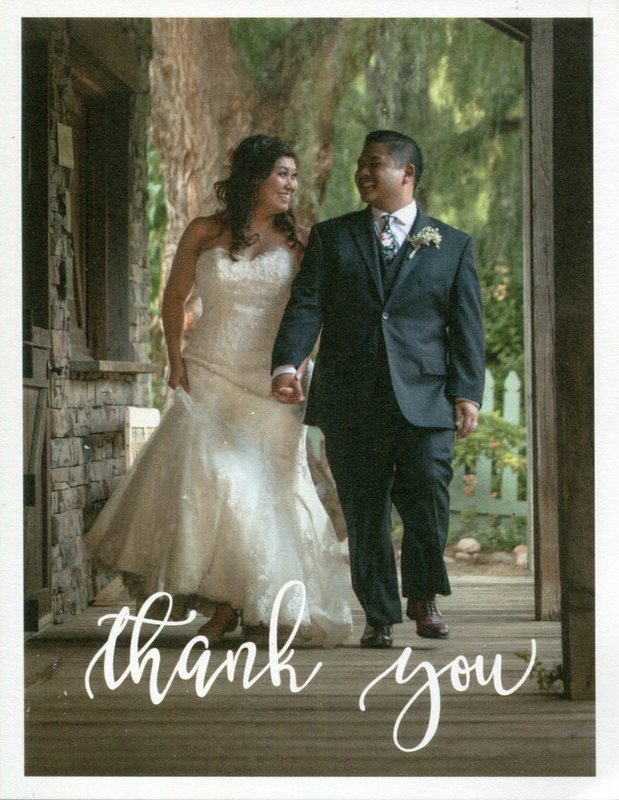 We received their thank you note very timely on quality card stock with a photo of Lauren & Kevin which I love. The backside of the card had imprint of the pink flowers from their invitation. See what she wrote below. And they included two candid shots of myself with some of my relatives. They sent what I consider to be “The Perfect Thank You Note”. ** And for those who say 'i didn't have time', after the wedding, they went on their honeymoon, they moved Lauren from Pasadena, CA to Washington DC where Kevin works. Lauren is able to continue her job via home office and still able to send out this wonderful note. They sent their Thank You Notes because they made time to do this important part of their marriage. Thanking their friends and family who witnessed and celebrated their send off to their wonderful new life! Below is an article written by Peggy Post, the great grand-daughter-in-law of Emily Post and published in the Emily Post Institute that provides some good guidelines on the Art of Thank You Notes and making loved ones feel that their gifts are appreciated. Contrary to popular myth, the happy couple does not have a year’s grace period in which to write their notes. All thank-you notes should be written within three months of the receipt of the gift. Ideally, a response should be written on the day you receive a wedding gift. If that’s not possible, set a daily goal. It’s a lot easier to write three or four notes a day than to have to write a hundred notes in a month after the wedding! First of all, stationery is the operative word here: No fill-in-the-blank cards, no pre-printed cards, no phone calls, no emails, and no generic post on your website! Personal stationery or store-bought thank-you cards are best. Monogrammed stationery should reflect your current name, so wait to use your married monogram until after the wedding. Creating a card with a photo from your wedding is a nice idea, but the timing is tricky. Don’t delay writing notes for gifts received before the wedding, and arrange to have the cards made quickly, so that gifts given at the wedding or just after won’t be kept waiting. If you really want to have your photo on the cards, consider using a photo from an engagement shoot or other special occasion instead. Anyone who gives a gift of money: cash, checks, contributions to savings accounts, and donations to charities. Mentioning the amount is optional, but it does let the person know the correct amount was received. You should mention what you plan to do with the money. Suppliers and vendors. You don’t have to write everyone you hire for services, but anyone who exceeds your expectations will appreciate a courteous note of thanks.